I took these pictures the other night out by my half-painted fence. 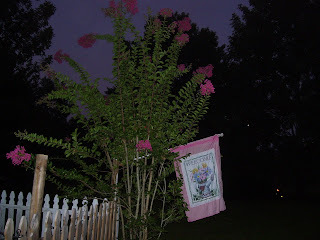 I wanted to show how pretty my crepe myrtle is since it has finally started to bloom. I wasn't sure if it was ever going to start blooming because we haven't had much rain at all until recently. I guess that is all that it needed to give it a boost! I love the color of the flowers. I realized how the sun had faded my flag so I went inside and got my other one. It looks so much better! I will post my new pictures soon of my fence all primed up. It is looking so much better. My little cottage is coming together and looking all prettied up. I love this flag. Garrett had orientation today at his school. Tomorrow is his first day. After school we will be doing the drawing! Looks pretty Lee Laurie! Thanks for stopping by and I wanted to tell you that our bunkhouse is a gust house but it is also where my son Shayne lives, I'm trying to decorate it without it looking to girly but it's really hard!! He said he doesn't care what I do but please don't do the flowered stuff, LOL!! The fence has character half painted, LOL! The flowers are pretty and I hope the day goes well for the little one! Ohhhh I LOVE your fence Lee!! I would love to have a white picket fence like that :) Nothing screams cottage more, does it?? Your lucky girl :) I cant wait to see it finished! I just love crepe myrtle...they don't grow up here much. 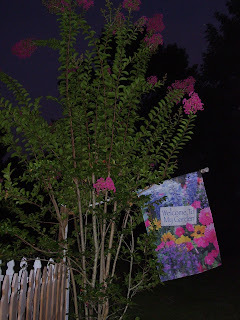 I have a garden flag that was brand new, but the first rain washed nearly all the color out...I was aggravated because it was a gift from my daughter! Ooohh such apretty picture to share !! Love the color of the flowers !! Your yard looks so sweet and cottagey !! 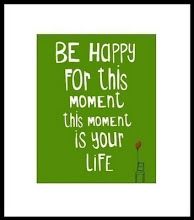 Hoping your weekend is a good one, and you're able to enjoy something fun !! Gosh, you've been a busy girl !! I'm a huge fan of picket fencing. I can't wait for pics when it's all done. The house, the fence, the gardens... a sweet cottage. Love your picket fence! I have been trying to get one for some time, hopefully I will soon. Can't wait to see if finished. Yur daughter's house is coming along nice, the blue curtains are beautiful, this has been a favourite colour of mine funning very close 2nd to pink lately.Have you ever tried a 'Tobi'?They are a steam type iron with a long handle. I borrowed one recently from my sister in law and i just have to have one! !They are great for ironing curtains,great for ironing our backdrops for our business too.Next best thing since sliced bread. I like your picket fence around your cottage, I wonder if you sprayed your flag with a clear varnish might stop it from fading. Love to you, Sweet L! HOpe this finds you well! I love picket fences & when we put one up our neighbor let us now HE didn't like it. It looked so pretty, but eventually we took it down & relandscaped which kept the neighbor smiling, & I love the new landscaping. 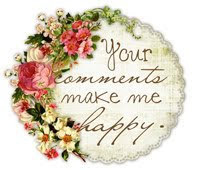 We are not confrontational & easy to please ... Your flag is really pretty, my colors. Hope all is well with you & yo feel better.